Implexus : Sarbanes-Oxley | GRC Software for Small- to Mid-Size Companies. 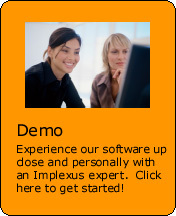 Implexus™ is a complete SOX | GRC software package that is designed specifically for small to mid-market companies. In addition to being "right-sized", Implexus is also fully customizable via OpenSource so that companies can choose to use Implexus as is, or make changes so that Implexus exactly fits their SOX | GRC processes. Implexus™ will help you with documenting narratives, documenting controls, performing annual risk assessments, creating test plans, running control self assessments, reporting and more! Take our FREE 30-DAY TRIAL and see for yourself what Implexus™ will do for your SOX | GRC process! Make your testing more efficient and risk-based by using the Implexus HeatMap and the Implexus Key Controls Optimizer. Copyright 2011 Implexus. All rights reserved.